Last juniors training of 2018 and before Christmas. Season seems to have gone fast this year. After training please mark yourself as attending for the Juniors Lock-up Tidy-up and hang around to give a hand. Also on the evening of the 15th is the annual Carol Crawl. Join up and sing a few songs for charity. There's lots of junior action on Sunday 16th, with 2 games at home. 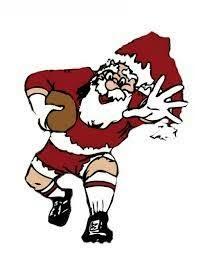 If you're around on Sunday morning then the u13s and u14s would appreciate the support, come on down to the heath extension for an 11am kick-off, Sunday 16th Dec.
Next juniors session will be Jan 5th, 2019. Happy Christmas and New Year - have a great break!! Weather has taken a turn, so important to make sure everyone has enough layers to train properly and stay warm. We train in all weathers. No zips, buttons or anything else that could cause an issue in contact please. The Pitchero club app is now accurate for all age groups, and training and fixtures updates will always be available there. Let the coaching team know when your kid is coming to training and their availability for games using the app, it's a simple 30 second job and really helps out. Our Juniors section has teams from u7 - u17 and a very successful Girls section. HRFC also team up with Ruggerbugs for u6s.